Baten Kaitos wasn’t a big hit. The game was co-made by Monolith Soft and former tri-Ace executive Hiroya Hatsushiba’s tri-Crescendo. Although it didn’t break any new ground sales-wise or game-wise, it was a modest success. While the graphics and story (by scenario mastermind behind such hits as Chrono Cross and Chrono Trigger, Masato Kato), the music, however, was perhaps the most impressive thing about the game. Motoi Sakuraba created an awe-inspiring score. Hatsushiba didn’t have the money to support a large orchestra (like Yoshiharu Gotanda and tri-Ace did with Star Ocean -Till the End of Time-), instead using only four live instruments and performers. Well, over two years later, Sakuraba’s returned to the Baten Kaitos series with Baten Kaitos II ~The First Wings and the Heirs of God~. The all performers from the previous game (except one, the violinist, Fumi Uchiyama, who is replaced by Reiko Tsuchiya) return to contribute their skill to the series once more, including some new collaborators, like Sakuraba’s daughter, Mio, and vocalist Hiroko Kato, both providing some vocal work for the score. As you can see, not much has changed. Let’s start with the introduction track, “Le Ali Del Principio”. This is the third time in game music that Sakuraba uses his daughter to perform for him. And unlike “So Alone, Be Sorrow” from Star Ocean -Till the End of Time- and “The whole new world” from Phantasy Star Online Episode I & II Premium Arrange, Mio actually sings to Italian lyrics, written by Yuko, supposedly Motoi’s wife. Anyway, the supporting music is orchestral, and with Mio’s touching and innocent voice flowing over the epic melody, the emotion is overwhelming. For those who do not know, this is also the final battle theme for the game, a little bit of a change from Sakuraba and Tohru Iwao’s electric power fest of “Violent Storm”, the final battle theme from the first game. Up next is “Splintered Millennium”, a short but epic piece of music, with brassy textures accompanied by synth chorals to a climaxing crescendo, perfectly leading into “To the Child of Time”, used in the opening sequence of the game. I can’t say this compares to the greatness of “Nadir’s Whale” from the first game, but when pictured with the opening scene, it’s a decent piece of music. Without doubt, the highlights of the soundtrack to the first game were the battle themes. Sakuraba once again mainly utilises the guitarist Tohru Iwao (from Guilty Gear X: Heavy Rock Tracks), though there is a greater variety of tunes, with a total of eight main battle themes, with one or two more scattered deep into the score. I’m totally baffled by the quality of the diversity. “The Valedictory Elegy” is the main battle theme. Just like “The True Mirror”, Sakuraba, the genius he is, takes control of the violin as the main ‘weapon’ of the track. If one listens closely, you can hear similarities in the melody of the theme to that of “The True Mirror” and, although the progressive rock style and theme structure is almost identical, there are plenty of components that make it entirely original. There is also an electric guitar version of the theme, “The Valedictory Elegy ~Guitar Ver.~”, which replaces the violin and takes the power to the next level, helped by Iwao’s guitar mastery. It’s guaranteed to make your head bop. “Poacher” was a little awkward to hear at first. I was hoping for a rockin’ guitar theme, but instead, I was blown away by a rich and evocative orchestral theme, with emotion and strength. After a few listens, I could not be more satisfied with Sakuraba’s result, even if it doesn’t have that velocity that Iwao showed on the original boss battle theme on Baten Kaitos. “Chaotic Dance 2” is a somewhat controversial arrangement of the classic dance and electronica theme “Chaotic Dance”. The theme is now practically a vocal theme with less electronica support, but I welcome the change, although understandingly, it will definitely not appeal to some people. This leaves us to “Iconoclasm”, arguably the strongest battle theme on the album itself. It’s magnificently composed with the support of Iwao’s electric guitar. Fast-paced and well-driven, this is how I like my battle themes. Unfortunately, Team Entertainment’s recording of the guitar is sadly muffled which restricts enjoyment. “Evidential Material” is used within a very important battle in the game (play it to find out! ), and like “Iconoclasm”, features impressive guitar work and structure. “The True Mirror ~Orchestral Ver.~” is an arrangement of everyone’s favorite Baten Kaitos battle theme, and it truly sounds bombastic in all its orchestral glory and brass pomp; not all will like the change, though it’s certainly an interesting one. Lastly, “Ruinous Commander” is played in the second last battle. It’s actually quite slow, but it’s undoubtedly composed well with operatic vocals and heavy brass themes. Certainly, this does not mean that the battle themes are the strongest pieces on the soundtrack. We are blessed with some truly outstanding tracks too. “Ancient Hometown”, a town theme, is both elegant and eloquent, being built up of harp, chorus and strings. The peaceful attempt Sakuraba tries to create is extremely pleasurable to listen to. “Water Cloud” has a great melody and is a powerful fusion between having progressive rock and orchestral themes. It’s without doubt a highlight on the second disc. “Holo Holo Bird” is an arrangement of “Holo Holo”, and successfully creates the tribal feeling unlike the inferior attempt in the original. Sakuraba uses the ethnic chanting vocals to light up appropriate atmosphere, in which provides a greater connection to what Sakuraba was trying to communicate in a tribal scene. “Heaven Sea Flower Temple” sticks closely the original theme from the first soundtrack, although it is further developed, thus being more enjoyable on the whole; the violin section is noticeably revamped, serving as a little gateway to classical music. “Powerful Language of an Old Soul” puts some power into the orchestral-dominant third disc. Instead of using Iwao, Sakuraba uses his synth electric guitar (the difference between the two is easily noticed), but the power still remains the same as other battle themes of the soundtrack. This is also the same with “Shogyo-Mujo”, except that it is a lot more guitar oriented. Continuing onwards, the brassy “Brave Way” theme and “The Road to a Dignified Future” shows that Sakuraba can maintain his impressive and grand orchestral styling, while not trying to manipulate the styles used in the Valkyrie Profile or Star Ocean series. The three ‘Peaceful Four Seasons’ themes are also an interesting bunch. They are all identical in track length and basic track structure, but each theme adds more instrumentation. So, in the first rack, “Peaceful Four Seasons I”, all that is playing is the harp, oboe, pan flute and some ethnic percussion instruments, and by the second theme, Sakuraba adds more oboes and contributes the strings. By the last theme, the typical Baten Kaitos brass is added complete with more harps. The idea may seem repetitive, but the theme never gets old; at least, not within each three tracks. “Bitter Enemies in the Same Boat” is fast and downright furious. Some may think that it’s the final battle theme, but it really isn’t. The brass and strings are in unison to create a brilliant orchestral power track. If it doesn’t grab you on the first listen, it will certainly grow and become more memorable over time. A series of dark and moody themes conclude the album. “Horizon of Mirage” is the first main ending theme, and musically the lightest of the bunch. It features strings and brass and clear concluding motive. But the real treat here is the final seven and half minute ending theme, “Shadow of the Moon on the Water’s Surface”, which reflects the drama from the ending theme of Baten Kaitos, “Addressing the Stars”. Sakuraba uses the main theme (“Le Ali Del Principio”) as the central melody of the track. It’s effectively very dark, portraying the evil that characters had to get through to complete their quest. In the last two minutes, Mio reprises to sing the main theme (like in the first track) with newly arranged backing music by Sakuraba, and it certainly concludes the track well, not to mention the game. But if you wait after the credits in the game, there is a secret cut scene, featuring the tracks, “Two Protecting Lights” and “The Original of the Wicked Way and the Prelude to Betrayal”. The former is only a short track which isn’t worth talking about, but the latter is a ‘bridge’ between Baten Kaitos II and its predecessor. The cutscene shows of the evil times ahead, so Sakuraba accompanies this with equally evil music, sharing a continuing and inconclusive feel. A good way to keep the listener in anticipation of further Baten Kaitos games! Sakuraba has created something truly amazing with Baten Kaitos II. The series’ signature ‘brassy style’, which was obviously adopted by a combination between Star Ocean -Till the End of Time- and Valkyrie Profile, is still strongly present, but the amount of bland tracks with this style is significantly lower. 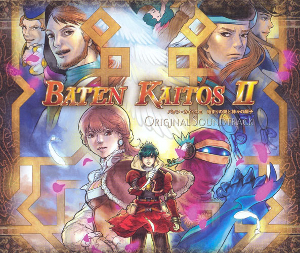 However, the amount of highlights in comparison to Baten Kaitos is considerably smaller (the whole of Disc One of Baten Kaitos was truly incredible), leaving a limited amount of incredible themes on the soundtrack. Would I recommend Baten Kaitos II? Absolutely! While not a perfect score, it’s definitely a score worth of high praise. Any Sakuraba fan should have this by now and, if you are new to the composer or wishing to try something new for a change, I suggest either picking this soundtrack or its predecessor’s. You can’t go wrong with either choice, as they are both marvelous feats. Posted on August 1, 2012 by Harry Simons. Last modified on January 22, 2016.